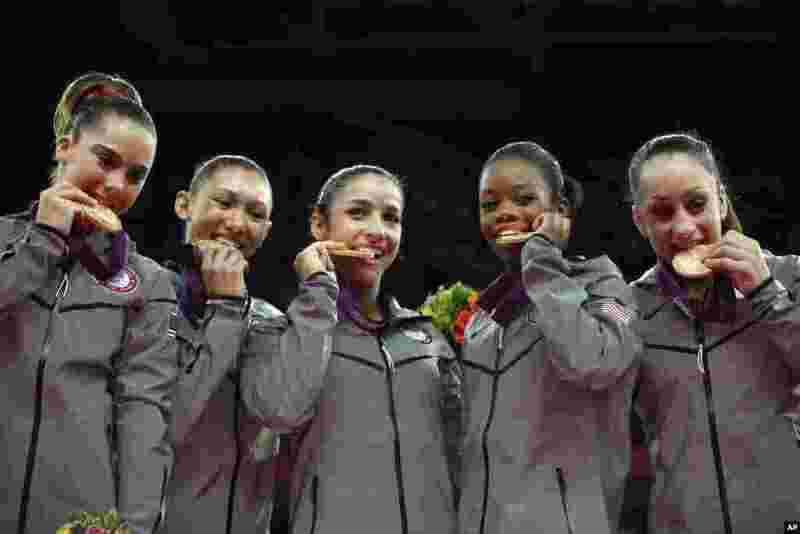 1 U.S. gymnasts McKayla Maroney, Kyla Ross, Alexandra Raisman, Gabrielle Douglas and Jordyn Wieber bite their gold medals at the Artistic Gymnastics women's team final at the 2012 Summer Olympics, July 31, 2012, in London. 2 U.S. gymnast Jordyn Wieber performs on the floor during the Artistic Gymnastics women's team final at the 2012 Summer Olympics, July 31, 2012, in London. 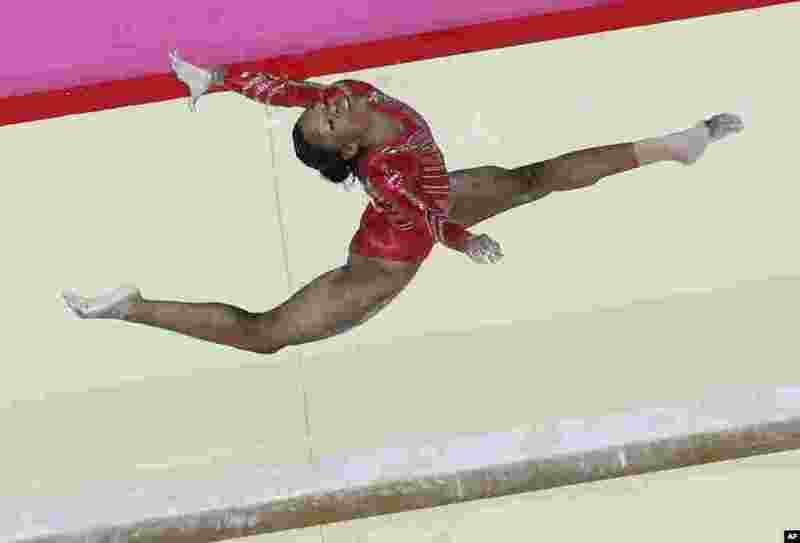 3 U.S. gymnast Gabrielle Douglas perfroms on the uneven bars during the Artistic Gymnastics women's team final at the 2012 Summer Olympics, July 31, 2012, in London. 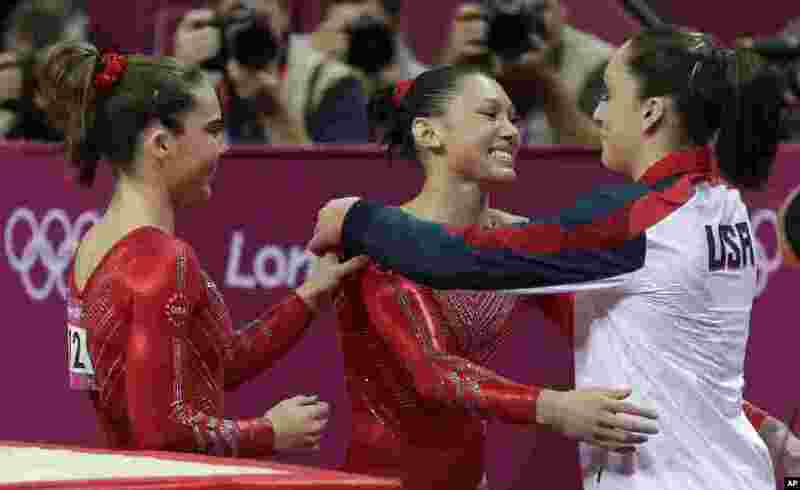 4 U.S. gymnast Kyla Ross, center, hugs teammate U.S. gymnast Jordyn Wieber during the Artistic Gymnastics women's team final at the 2012 Summer Olympics, July 31, 2012, in London. 5 US gymnast Gabrielle Douglas performs on the balance beam during the Artistic Gymnastic women's team final at the 2012 Summer Olympics in London, July 31, 2012. 6 U.S. gymnast Kyla Ross performs on the uneven bars during the Artistic Gymnastics women's team final at the 2012 Summer Olympics, July 31, 2012, in London.